UPPER EAST SIDE — Glitz and glitter know no boundaries at this dance studio, and wheelchairs are welcome. 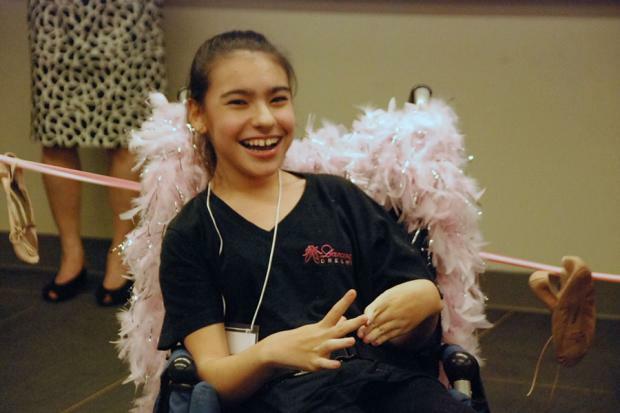 “I never thought of being different, but knew I was,” said Veronica Siaba, a 14-year-old with cerebral palsy who’s been dancing for eight years with the Queens-based Dancing Dreams program. Now, the program’s sparkle is about to cross the East River. Starting this fall, Dancing Dreams will begin offering classes in Manhattan, thanks to board member Valerie Rowe, who helped land space in the Museum of the City of New York for the next year. It’s a temporary location, since the museum, on Fifth Avenue at 103rd Street, will be undergoing construction. “We’ll need to move and find a more permanent space,” Ferrara said. Still, for the dancers, their parents and the army of volunteers who make the program possible, it’s an exciting move. The students, many of whom have cerebral palsy or spina bifida, don the typical sequin-heavy dance duds and ballet shoes of girlhood dreams. But many also rely on leg braces, canes, crutches and wheelchairs for support. Teen volunteers work alongside each dancer to help them stand and keep them stabilized. “The girls make friendships, and they’re not judged. It’s about what you can do, not what you can’t do. It’s a fantastic program,” Veronica’s mother Maria Siaba said at a ribbon-cutting ceremony last week at the museum. Ferrara started the classes after one of her physical therapy clients, while wearing a tutu, complained that she longed to learn how to dance. The program has thrived since its first year, when there were just five girls enrolled. Dancers come from throughout the tri-state area, and the new location in Manhattan will make it easier for some to attend classes. Steve McConnell’s daughter Catie, who turns 11 this week and has cerebral palsy, has been trekking to Queens from their home in Wayne, N.J., to take classes for five years. Veronica, who lives in College Point, Queens, told a story about how a girl in her school had seen one of her dance performances and later came up to her to say she was sorry. Classes will run in Manhattan on Monday afternoons from September through May. The Queens location will continue to offer classes on Thursday afternoons. Participants are asked to make a voluntary contribution to help cover costs — the suggested donation is $375 per year — but “no one is ever turned away for inability to pay,” Ferrara said. About 85 percent of dancers are on scholarship, she said. Dancers learn ballet, tap and some jazz moves. “This past year we even did the tango,” Ferrara said. Her experience as a physical therapist is crucial, she said. “My PT training allows me to adapt every activity for each girl to participate to the fullest of her ability, and allows us to accept dancers with more significant medical issues. Another key to Dancing Dreams’ success is its Teen Leadership Program, run by Rowe, who recruits and trains the volunteer helpers. Scarsdale High School students Sami Silberberg and Katie Garrisi have spent the past few years as Dancing Dreams volunteer helpers — one-on-one and sometimes two-on-one aids who assist the dancers. When it came time to pick a recipient for the Scarsdale High’s annual carnival fundraiser, the girls, who are also student government leaders, suggested Dancing Dreams, Silberberg said. Their student government adviser, Neil Ginsberg, was on hand at last Monday’s ribbon-cutting with a check for $5,000 for use toward the Manhattan program, as was Victor Calise, commissioner of the Mayor’s Office for People With Disabilities. Parents had high praise for the teen helpers. JoAnn Chaffardet’s 13-year-old daughter Monica started at Dancing Dreams when she was just 4 1/2. Typically, volunteers are in high school and age out of the program after graduation. Perez, a 19-year-old who attends Baruch College, is an exception because she didn’t leave the area to start college. Actresses Sharona D’Orvellas and Blanca Camacho, former cast members of the Broadway hit “In the Heights,” were there for last week’s kick-off event. Camacho learned about the organization after receiving an invitation to attend the April recital. Perez had seen “In the Heights” and remembered that she and Camacho share an alma mater — St. Michael Academy, a private Catholic academy for girls in Midtown Manhattan that closed in 2010. She had the school’s alumni association track down Camacho — who is now working to get more professional dancers involved.